Amazing Female Pilots of The 20th Century! Who Are Those Brave & Daring Female Pilots Of The 20th Century? During World War II there was a Very special and Brave group of Female Pilots who joined the (WASP) Woman's Air Force Service Pilots program. This might have never come to be, if not for the hard fought efforts of the aviatrix Jacqueline Cochran. Through her constant pleading and lobbying with the First Lady Elanor Roosevelt to form a womans pilot corp. Eventually in 1942 General H.H. Hap Arnold agreed to allow woman to fly military aircraft of all type in a supporting role. 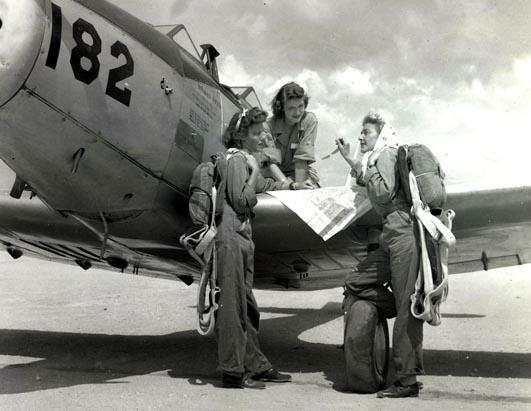 Soon over 25,000 woman volunteered to join the WASP program but only 1,800 were selected, of which only 1,102 graduated. 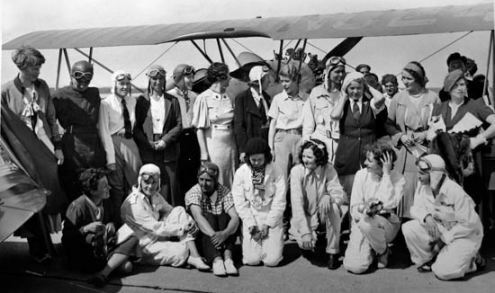 These brave female pilots flew a combined total of 60 million miles faring Transport planes, Fighters, Bombers, and even small scout planes around the United States, to Hawaii, and across the Atlantic. They even flew the Bombers while the men Bombardiers practiced dropping there bombs on desert targets. The woman pilots also pulled targets for the ground gunners to practice shooting at. While performing these dangerous assignments many of the WASP were killed and never given any kind of honors at there burials. Because officially they were not part of the military, they were considered Civilian. And thus denied any kind of honors in life or death for performing their duties. Years later this decision would be reversed and all the Woman's Air Force Service Pilots would be awarded the Congressional Gold Medal for there service and duty to Country. And today Woman openly serve side by side with men in the Armed Services. The above article is a tribute to all the woman who served during World War II in the United States WASP program and freed up thousands of Airman to fight the enemy in the Pacific and Europe. While back home the WASP assisted in training exercises and ferried planes all over the country as needed. This page is going to introduce you to a few of the Greatest Female Pilots of the 20th Century, so fasten your seat belts and enjoy the ride. Amelia was definitely one of the most famous of them all when it came to female pilots. She loved flying like nothing else in her life, Amelia talked to every pilot and hung around all the local airport's listening and learning everything she could about flying. She was dedicated to the persuit of Aviation from a young age. It's truly amazing what one airplane ride can spark inside someone, and where that passion can ultimately sweep you away to. In Amelia Earharts brief but colorful life she accomplished things that very few if any ever do. She set Endurance flight records, distance records, and even altitude records. She also was the first female pilot to fly across the Atlantic. For more information on this amazing woman and her accomplishments click here Amelia Earhart she was a true inspiration to woman all over the world and dedicated her life to aviation. Harriet Quimbey was America's first licensed Female pilot in 1912, she was awarded this certificate by the Aero Club of America. On April 16th, 1912 Harriet became the first woman pilot to fly across the English channel of the day. Her flight lasted 59 minutes and flew a distance of 25 miles. Normally this amazing flight would have gotten lots of media attention. But one day prior to her flight on April 15th, the HMS Titanic sunk and dominated all the news services for months. That one flight made by Harriet Quimby had a major influence upon the role of woman in aviation. This was one very brave and courageous woman of the day. Back then planes were not considered that safe or reliable to fly as seen with what happen next to Harriet during her next flight. 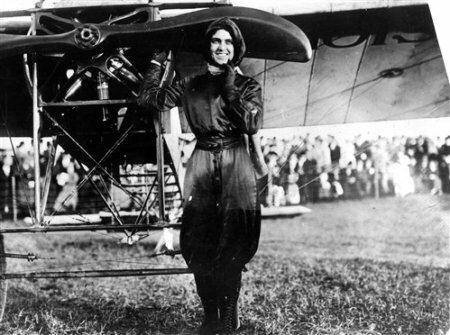 On July 1,1912 Harriet Quimby flew in the Third Annual Boston Aviation Meet in Squantum, Massachusetts. During this flight she and one passenger were killed when her plane suddenly lurched forward throwing them both out to fall to there death from 1,500 feet. 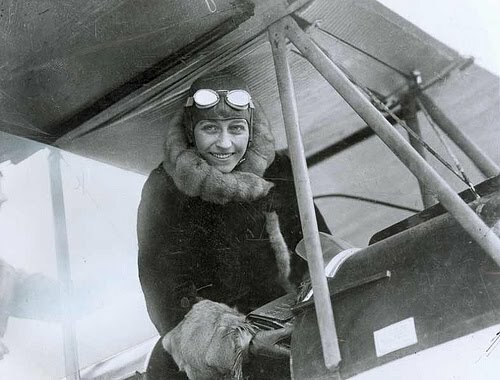 To learn more about this great female pilot Harriet Guimbey read on. She died at age 37, her impact on woman pilots would be felt for years to come. Pancho Barnes was another one of those amazing pioneer female pilots. She was a flamboyant and hard talking pilot with a passion for flying like no other. She was more at home with the men pilots than she ever was with the woman. 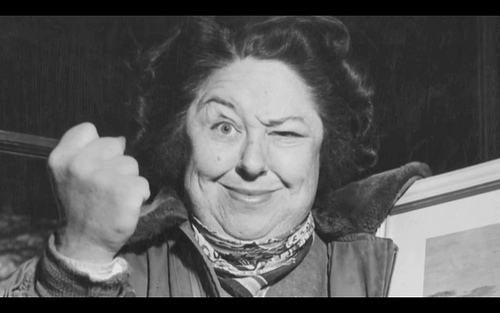 Before World War II she made quite a name for herself racing airplanes like the Mystery Ship in Air Races. During the War Pancho Barnes had a Dude Ranch named "The Happy Bottom Riding Club" out near Edwards Air force Base. While there she became friends with some of the most famous pilots of the time, and entertained the service men through out the war. To read more about this incredible woman Pancho Barnes and enjoy, they don't make em like her anymore! During Pancho Barnes life she never let anyone or anything stop her from going after what she wanted. She was a fighter to the very end. Unfortunately though after two unsuccessful cancer surgeries she bought the farm in 1975, alone and broke. Just two years later her only son died while flying his P-51 after a mechanical failure occurred with the plane. Another famous pilot was Bessie Coleman, she was the first female pilot of African American descent to have an International pilots license. Bessie was born in Atlanta, Texas on January 26,1892. Her parents were share croppers and she was the 11th of thirteen children. Bessies father was part Cherokee Indian and faced constant racial barriers. Finally in 1901 he got fed up and left the family in Texas and returned to the Indian Reservation in Oaklahoma. After her father left, bessies life changed in major ways. She moved in with her brother who lived in Chicago. While there she took French lessons, and a short time later traveled to Paris on November 20, 1920. shortly after that Bessie started her flying lessons in a Nieuport Biplane. And on June 15,1921 she obtained her Federation Aeronautical Internationale pilots License. And became the first African American woman in the world to do this. While in Europe Bessie took advanced flying lessons to hone her skills that she would need to launch her exhibition flying. After she returned to the United States around May of 1922. For the next 5 years "Queen Bess" as she was known was extremely popular. While in Jacksonville Florida on April 30,1926 and practicing for an Airshow in her Curtis JN-4 Jenney plane. Bess was thrown from the plane in a spin, and her mechanic was killed while trying to regain control before it crashed. That flight bessie did not have her seat belt on, and sadly she payed the ultimate price. 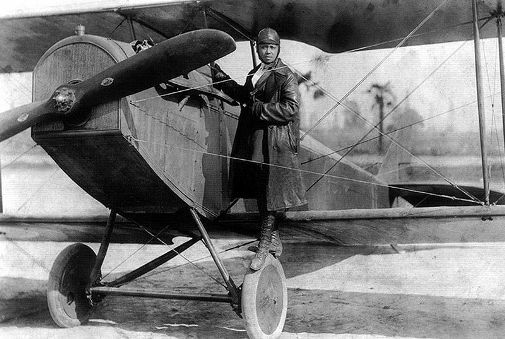 Bessie Coleman never did achieve her dream of a flight school for the blacks. But she was a true inspiration to all the African Americans world wide. She will always be remembered for her level of professionalism and skill in her flying. Even though her aviation career was brief, she accomplished a lot in a short time for a young woman of her ethnic background. Are next female pilot is Amy Johnson who was a very famous British pilot. She became famous for being the first woman pilot to fly solo from Britain to Australia in 1930. In 1931 she and her co-pilot Jack Humphrey became the first pilots to fly from london to Moscow in one day. They flew over 1,760 miles or 2,830 kilometers in about 21 hours. They then went on to fly across Siberia and onto Tokyo setting another record. In 1932 Amy Johnson was proposed to and married by a Scottish pilot she flew with for only eight hours named Jim Mollison. In July of 1932 Amy flew from London to Cape Town, South Africa solo and thus, set another long distance record. In 1932 Amy and her new husband flew from Pendine Sands, South Whales to the United States. But crashed landed in Bridgeport, Connecticut after running out of fuel. Both were hurt but recuperated and were given a ticker tape parade in New York City. Picture From The British National Archives. In 1934 the Amy and her husband made another record breaking flight from Britain to India in there De Havilland plane. Amy Johnson had one more record breaking flight left in her. In 1934 she flew from Britain to South Africa again. In 1938 Amy divorced Jim Mollison and went on to join the Air Transport Auxiliary. While transporting an aircraft one day she supposedly ran out of fuel and bailed out. she was seen alive in the water, but the rescue attempt failed. A memorial service was held on January 14, 1941. Thanks so much for flying in and checking out our new Female Pilots Pages 1-2. As always, stay safe and "Happy Flying".